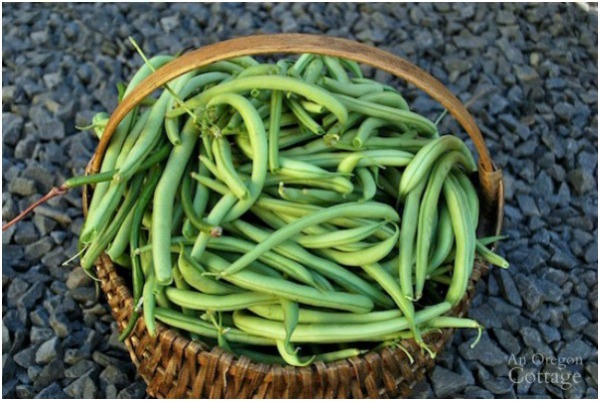 Six reasons to grow filet-style pole beans instead of more popular bush green beans – and why Emerite and Fortex green beans are two of the best you can plant! Pole beans are easier to harvest than bush beans. With bush beans you have to bend over, man-handle the plant (sometimes pulling it up mistakenly), all in the effort to find those beans. 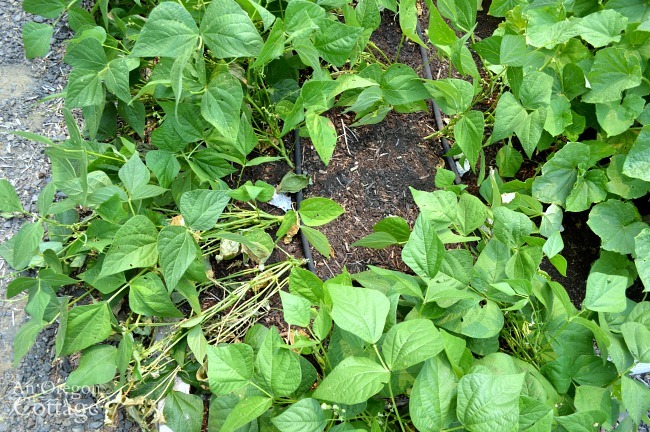 Once pole beans grow, it’s just a matter of standing and picking them conveniently at your waist to head level. Many types of bush beans produce for only a short period, requiring succession sowings to get beans over a whole growing season. Poles take a bit longer to get going, but they produce (mostly) for a whole season. Bush beans are often a lot dirtier than pole beans (most of the time I don’t even have to wash pole beans before freezing without blanching). So now I plant mostly pole beans, with just 3-5 bush beans to harvest earlier beans. And my favorite variety to grow is Emerite pole beans, by far. I’ve grown them since discovering them years ago, even though it seems harder each year to find seed companies that carry them (I’ve tried to keep a few each year to replant, but we eat most of them into the fall, so it’s hard to remember to let some grow to seed-saving stage!). And this is a mystery to me- why don’t more people grow these beans? I’ve tried many others, including the “popular” Kentucky and Blue Lake (and Kentucky Blue cross) varieties, but I’ve found them to be stringy and tough with inconsistent production, at least where I live. 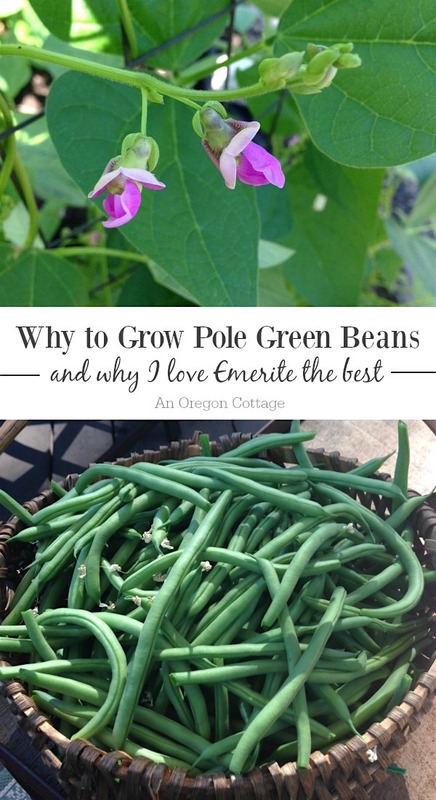 I sure don’t want to keep this wonderful bean a secret and I’d love to have more people growing it, so I thought I’d do my part and share with you the reasons why I love Emerite pole beans and where you can find seed if you’d like to try them. Update: since the original publish date of this article, I’ve found another pole bean to grow alongside Emerite that produces during Emerite’s ‘down time’ when it’s hot – Fortex. It’s also a filet-type bean, though it grows much longer than Emerite. I will include where to buy it as well. 1. The are a “filet” type bean- but unlike the small bush types you may be used to, these beans can be picked at all stages– the 4-inch thin filet style (which is great at the beginning of the season when you can’t wait for the first beans! ), all the way up to a mature 7 to 8-inch round bean. 2. Because they are a filet, they are never stringy or tough– even when they’ve been left to mature to a large bean. Never. 3. They produce a lot during the main season. This year my 10-foot row has produced enough for us to eat tons of fresh and still have 10 quart bags in the freezer for the winter. 4. Emerite may slow down after the large main harvest, even losing a lot of leaves in the hot last days of August- but don’t give up on them! As soon as the weather turns “fall-ish” with cooler temps and some rain, they will start leafing out again and producing flowers and beans- all the way until the first frost. All those beans pictured above were harvested at the beginning of October. Fortex produces through warmer weather, but doesn’t produce as long as Emerite, making them perfect to grow together! And I LOVE eating fresh green beans in October! The bush beans? They are gone. Done for. Outta here. 5. They are so much easier to pick than bush beans! 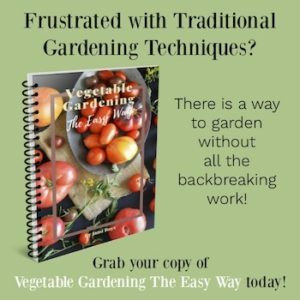 Umm, do you like to hunch over, struggling to find the ripe beans on a 2-foot tall plant- often damaging the plant in the process – or stand up and pluck the beans you can easily see are ready and hanging almost at eye level? That’s a no-brainer for me, especially with my creaky back. 6. 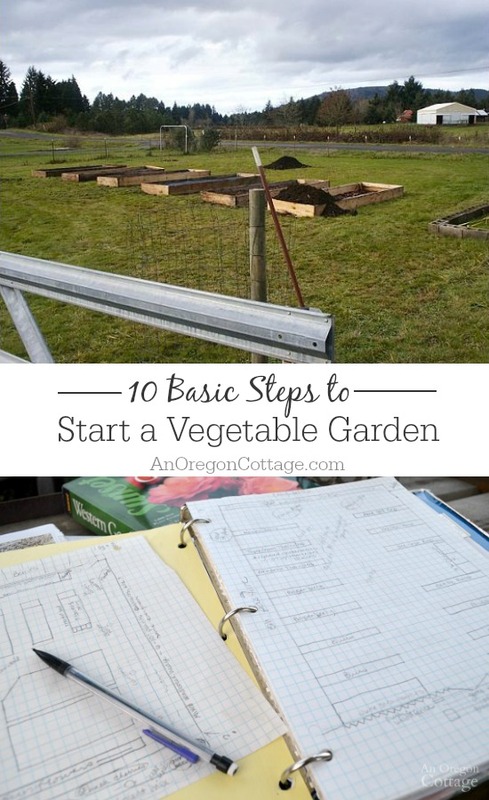 You only have to plant pole beans once. No succession planting is needed like with bush beans. It’s true that poles take a little longer to start producing, so I do plant a few bush beans, like I mentioned, at the same time to give us the earliest harvest, but there’s just no comparison to the longevity of pole beans. Have I convinced you to grow some yet? Let me know what you think! 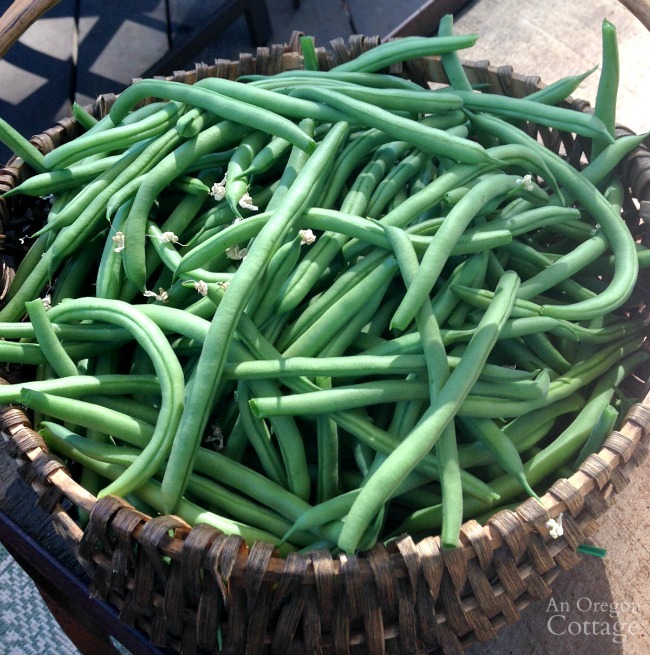 Are you a bush or pole bean lover? Note: This was originally published in October of 2011. It has been updated with new photos, pinnable image to help you remember where you saw this, newer formatting and information. This year was the first year we actually got beans to grow! I don’t even eat green beans, but my family like them so I planted 2 rows of bush beans. They did great until they were infested with all kinds of pests. It looked like every possible bug was eating them. We got enough for a few meals and maybe 2 quarts for the freezer before I gave up and tore them all up. I live in the southeast where we have a long growing season, so I’d like to plant more. I haven’t been able to find seeds, so I may plant something else instead and try pole beans next year. You are right about bush beans being a pain in the back! I tried getting my 3 small grandchildren to help pick, but they saw bugs and didn’t want anything to do with the whole thing. Do you do anything to keep yours bug free? I have tried peppermint sprays, a concoction of onion, garlic and mint, but nothing worked. I would love any tips y0u have for keeping bugs off organically. Oh, that is frustrating about the bugs, Barbara. Even though it sounds like you tried something similar, the garlic-mint spray that I make has worked wonderfully on our beans as well as our basil (you can click on the link from that page to the FAQ and hear how it’s worked for others, too). I’ve also used sticky traps (just stakes in the ground next to the plants of yellow squares covered in a sticky goo) to catch them, and Bt as a last resort (though still organic). I just saw on Territorial Seed’s website that they have seed for Fortex beans — yay! I’m still going to see if I can grow some of each of these. Garden planning…gotta love it! Wonderful – it’s the combo I love now, too Beth! For more than 30yrs it was regular bush beans or filet bush which i like best. This summer I planted a 10ft section of pole beans and now wonder where my head was at all those years. From now on only pole beans and FORTEX filet at that. Nice article thanks. Great article on pole Beans. 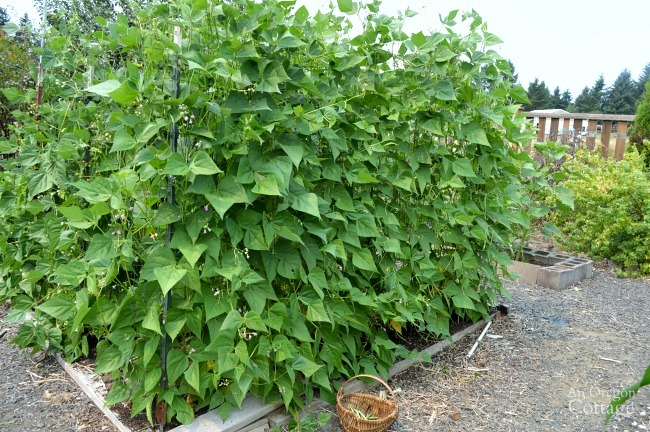 I have grown french filet bush beans for years, but the last five years, I have put more attention toward Pole Beans, and like you, Emerite were always my favorite, and I also discovered Fortex some years ago as well. And like you, why bother to bend over to pick bush beans when you can reach up and easily pick pole beans? However, this coming year, the only Pole Bean I will plant, will be one called “Caramint”. Why? If both “Emerite and Fortex” get lost in the poles and leaves and get old, they are not the best to eat, while, “Caramint” which is a bright shiny purple, grows easily to 12″ long plus, is so easy to recognize amongst the green leaves, and never, ever tough! When cooked, they are a nice dark green. Additionally, if one plants any beans in succession crops, every two weeks, you will have fresh pole beans all summer, not just all at once. You know this, just passing it along to your readers. Cheers! I misspelled the purple pole bean :Carminat”, available from Burpee/Vessey’s, etc. That variety sounds amazing, Frank!! I’m going to have to try it – along with Emerite, of course. 😉 Thank you! I picked up Emerite beans at our nursery this spring and was pleasantly surprised. I am a huge fan now and will plant from seed this year and take your advice to add Fortex. Thanks for the info on harvest time because I suspected I could have kept the plants into the fall season, alas, I had not this year. Yay! I’m actually glad to hear you found them at a nursery – they’re harder to find and I’m hoping they don’t stop producing them! On your recommendation, I grew the Emerite pole bean this year. 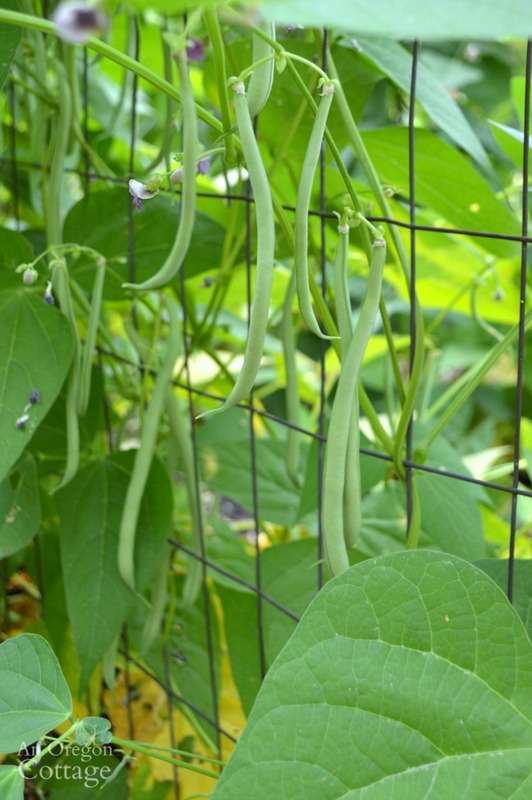 I have always grown pole beans, primarily the Asian long bean types. Thank you so much for your article, and for introducing me to the Emerite. I will always have a place in my garden for this fantastic bean which is beautiful to look at, delicious, and amazingly productive. Your recommendations…are they good canners? I only saw you mention freezing. I have pressure canned them in the past and they worked great (we just don’t prefer beans preserved that way). I do regularly pickle them, though (the recipe is on the site, with pictures showing them pickled), and they are also good this way. My beans went in a little late and I am still waiting on my Emerites to get big enough to pick. I wanted to mention another pole bean that I am harvesting now: Spanish Musica. It is a little different that the regular-shaped filet bean with a wide, flat bean growing 7 to 9 inches long. My daughter pronounced it “amazingly delicious”! They are good cut into pieces and steamed, or … my favorite…. blanch and toss with a balsamic vinaigrette and fresh tomato wedges for a different kind of salad. I agree with you completely! The Emerite is FANTASTIC!! I haven’t had a garden for the past 5 years due to traveling abroad and am now finding it quite difficult to find the seeds. Thank you for posting where to find them. I also look forward to trying the Fortex. Happy! Happy! Thank you for this info! This will be my first year trying pole beans. My dad (a master gardener of over 50 years gardening) has never grown pole beans! I’m trying Emerite. ? Are they an heirloom? Have you had good success the years you’ve saved their seeds? Yes, they are an heirloom Jennifer and I’ve saved the seed from year to year easily. The last few years especially, because they seem to be hard to find or sell out quickly. 🙂 I hope you find them as wonderful as I do! I have a question for you! On two occasions in the past I planted pole beans and was terribly disappointed. In fact, we only ate two meals of them. Here’s the problem I had: When I planted bush beans, I could always tell when they were ready by the size of the pod. But with the pole beans, when they looked big enough to harvest, they were absolutely tough and stringy! Just awful! If I picked them when the pods were smaller they were more tender, but the beans inside them were so tiny that I felt we weren’t getting our “nutrient load” from them. Any suggestions or advice? Just ordered these seeds to try in my 2017 garden. Thanks for the blog. I thought you’d like knowing that it is still relevant 7(?) years plus after posting! Wonderful, Michelle – they are still my favorite!! I hope you enjoy them, too. Oh, I’ll have to look for that, Sylvia! I tried a pole bean labeled ‘gold filet’ last year and it was NOT. Thick, tough beans. 🙁 Nice to know there is actually one. Ack, seriously? That would be frustrating – I hope it doesn’t make it’s way here! Jami, I’ve followed your recommendation for Emerites and have had great success for two years. I had major problems with stringy beans before switching – they were basically inedible. I have had luck also with Blue Lake S-7. I still favor Emerite, but the S-7 is not stringy and actually does better than Emerite towards the end of the season here in Philadelphia. I harvested from mid-July into October (no real frost until November; very warm fall) although production slowed near the end of September. I planted 12 ft of beans and harvested 47 pounds. Jung has Blue Lake S-7 and also carries fortex. Be sure to get the S-7 and not just any Blue Lake. Thanks for the tip, Mike! I actually haven’t heard of Blue Lake S-7! I wonder what the difference is – like why wouldn’t they have just named it as a different variety? I did some internet searches. It looks like the S-7 was developed to make the Blue Lake stringless. I had planted Blue Lake the previous year and it certainly had strings. Not sure why they still sell it. By the way, trying to find out who developed it was not easy. There is a reference to Asgrow seed company, which is the seed company for Monsanto – not a plus in my view. They seem to be big in soybeans. I’m curious if you grow a tee-pee of fortex and one of emerite beans near each other (like maybe 5 feet apart), would you still be able to save seeds that are true to type from each variety or would they cross? You know, I don’t know, Kathy! I do grow them right next to each other (in rows now) and I know that Fortex is open pollinated, but I haven’t done research to see if that would be a problem. Thanks for your reply. I was just curious if you ever noticed any weird stuff come up from saved seed since you grow both. 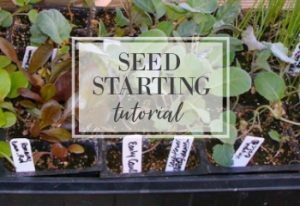 I’ll probably give it a try just to see… at least if I can bear letting any go to seed! 🙂 We grew emerite last year (based on your recommendation– thanks!) and are trying fortex this year, along with a couple of others. Hooray for beans!! This post was really exciting. 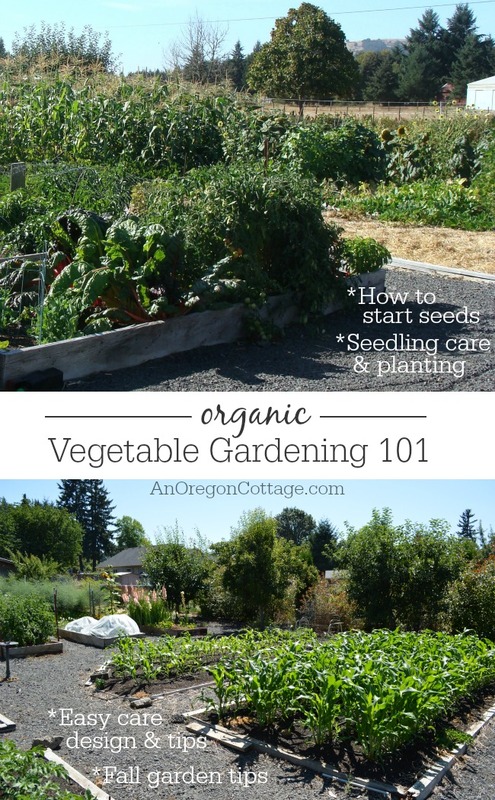 I haven’t quite figured out how to have a garden – I live in the desert southwest (and boy do I miss Oregon!!!) and I’m not sure what to do with our ridiculous heat. 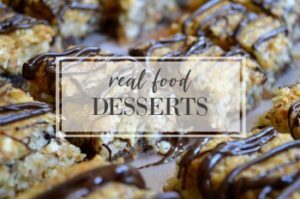 Definitely want to grow those pole beans when I get that sorted though – I’m convinced! Do you think they would work on a fence?